(2) I learnt to always look at the bright side of things even if something seemingly bad have happened. (3) I learnt that there is no such thing as "Coincidence" because everything is meant to happen for a specific purpose. Find Your Path workshop was very interesting and informative. I discovered hidden values in me. The davinci note tip was of great benefit. I started to organize my thoughts and accordingly started to achieve my goals. The team work was very cheerful. Identify your true dreams, true passions, talents, and potentials. Then, you will learn how to gather needed resources that enables you to turn your dreams and wishes into accessible goals. And, implementing your true vocations. Note: Find Your Path runs in a special version for teenagers. It takes them through the journey of defining their intention, life meaning and passion... discovering their unique hidden talents, potentials and dreams and learning how to put those dreams into action. Find Your Path for Teens is not for any teenager, it is for those with great ambitions and dreams, those who want to become leaders in their community, those who want to change the world by changing what is in themselves first! And, don't worry if you think you have no talents, you are not unique, or you are not special... I've been there... and, I've got you covered! 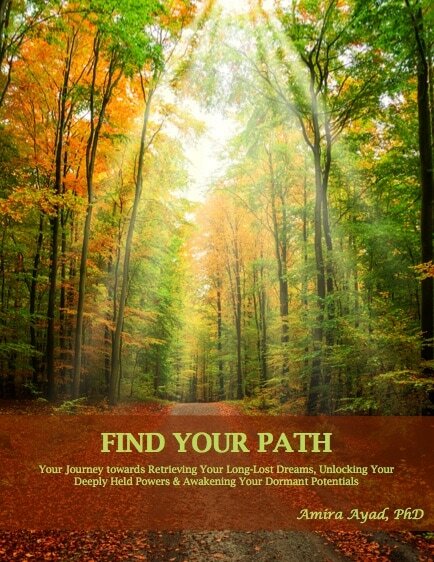 FIND YOUR PATH WORKSHOP IS BASED ON MY BOOK "THE TRUE SECRET"
Through easy to follow exercises you will be able to transform your life from inside out, make better choices and get more out of your time combining the work of science and NLP with the feelings and whispers of your body, heart and soul. Module I: Let’s Start: In the 1st module you will be exploring the variety of tools needed for your journey. You will learn about both material and spiritual tools. You’ll also start reflecting on your responsibilities in life and learn more about your own Path and journey. Module II: Define your objectives: In the second module, you will be defining your objectives, goals, and dreams and devising some short and long-term plans. Module III: Find a challenge: In this module, you will learn the meaning and need for challenges. You will set some challenges and review your plans and dreams in light of those new challenges. Module IV: Be a believer: This module will teach you how to check and reconsider your long-held beliefs. You will learn the importance of the subconscious mind and the power of positive affirmations. Module V: Be Powerful: Through easy but powerful tools and exercises, you will learn to boost your self esteem and dig for your strengths, skills, and powers. Module VI: Don't be Afraid to be Different: More boosting of your self confidence. You will also learn more about your Goals and set Milestones on your Path. Module VII: Gathering Inner Resources: Your journey needs lots of resources... You'll start with the inner ones... You will learn to prepare your heart, mind and soul for the mission you are embarking on. Module VIII: Outer Resources- Knowledge: Knowledge and learning are essential tools to succeed... Let's make sure you're set to go! Module IX: More Outer Resources: In this module, you will learn to manage your time and gather your tribe. No one can travel alone, you need a support system. Module X: Even More Outer Resources: Now that your heart, mind and soul are ready and that your have the knowledge, managed your time and gathered your tribe let's make sure you have the energy and stamina to take the road... You need to learn how to keep your body healthy and how to live a holistic life where your Body, Heart, Mind, and Soul are in total harmony and peace. Module XI: Fulfillment: Time for action. Time to take risk and go for your dream. That is of course if you haven’t already started. your plans, you’re ready BUT …are you really? This module will deal with the very important concepts of surrender to the Divine, flexibility and accountability... Those are the lights needed to keep you on your Path heading for the Right direction.